It’s around this time of winter, no matter what the temperature (it’s 2-below-zero as I type this), that I start thinking about spring gobbler season. I can’t help myself. That month of May (and a bit earlier in Pennsylvania and during the New York and Pennsylvania youth seasons, as well as during any special road trips we might take) is just so special. It’s my World Series, Stanley Cup Final, and Super Bowl all rolled into one exhausting 45 days or so. Thankfully, Paula shares the same feeling; even during deer season she often remarked about how good a particular setup would be for turkeys in the spring. So it’s perhaps no surprise that I begin fiddling with turkey calls while at my home office desk. It’s probably best that I work out of the house; I can only imagine how fellow employees would feel while I cranked on a mouth call or played with a box or pot call during a brief typing break. Our two Labrador retrievers even get a bit tired of it, slinking downstairs to the couch instead of taking up residence in the office or on the bed. 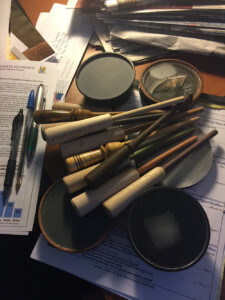 While most of my in-office calling involves mouth calls (I really do need my hands free to get some work accomplished), every once in a while I’ll grab one of several pot or box calls sitting on my desk. A minute here and a minute there and you’d be surprised how much your yelps, clucks, and purrs improve heading into the season. It’s also a great time to begin matching up various strikers with different pot calls, whether they be slate, glass, copper, aluminum or crystal. You’d be amazed how a simple switch from one type of striker to another can completely change the sound of a pot call. Just when you’re ready to relegate one to a stash of calls in your camo bag, you connect with the right striker and you’re ready to put it in your vest for future action. Develop a system for matching up strikers and pot calls so you don’t have to repeat the process to figure out which striker works best with which call. Whatever works for you; for me, it’s simply writing on the handle of the striker what call I use it with. Sure, it’s only February. 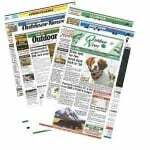 But spring gobbler hunters understand completely when I talk about breaking out the calls, watching some turkey hunting videos and even taking a tour around the hill for some pre-season – really pre-season – scouting. I just can’t help myself, and chances are, neither can you.